Hoggs of Fife are renowned for their value for money country clothing and footwear. When the business was founded 125 years ago, the main customers were farmers and others employed in agriculture. Over the years, the desire of Hoggs of Fife to provide quality work clothing and footwear for the agricultural community has never faltered. The Hoggs of Fife Professional Workwear range sits nicely alongside the Hoggs of Fife Classic Countrywear range and also their Fieldpro Hunting & Shooting clothing. At The Country Catalogue we find that the Hoggs of Fife Green King waterproofs are ideal for anyone working outdoors in even the toughest weather conditions. These unique and highly specified technical waterproofs are made using state-of-the-art hardwearing Ripstop™ outer shell fabric with fully taped seams to provide 100% waterproofness. The Hoggs of Fife Green King Jacket has numerous features including elasticated fleece storm cuffs, a studded storm flap with drip channel over the full length 2-way front zip and a nylon drip strip on the lower part of the internal lining. Both the Hoggs Green King Jacket and the Hoggs Green King Trousers have Cordura reinforcements in the high wear areas and are windproof and breathable. Also part of the Hoggs Professional Workwear collection are their Waxed Over-trousers. Fully lined and generously cut, these are deigned to wear over your normal trousers. They have an elasticated waist and adjustable side-straps. 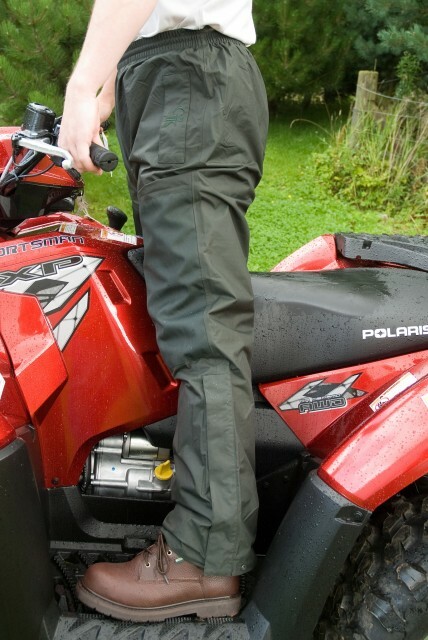 If kept well maintained with Hoggs Professional Dressing for Waxed Cotton Clothing, these over-trousers are highly water resistant but not 100% waterproof. The sturdiness of Hoggs Waxed Over-trousers makes them very popular with farmers and beaters alike. Poly/Cotton Country Check shirts are an integral part of the Hoggs of Fife Professional Workwear collection. A great favourite with Country Catalogue customers, these shirts perform well as a shooting shirt, a work shirt or a general country shirt. Manufactured from soft, brushed easy-care 65% polyester and 35% cotton fabric, they have a classic collar and a deep breast pocket with buttoned flap. To ensure that the shirt stays in, the Hoggs of Fife Poly/Cotton Country Check Shirts have a long tail, front and back and are available in four sizes and three colour combinations. Footwear is obviously an important consideration when you’re spending time outdoors in the country. If you’re looking for a waterproof work boot, then Hoggs of Fife have the answer with the GT3000-WNSL. It has remarkably high specification for the price, offering benefits such as a hard-wearing oil resistant rubber outsole and a fully waterproof and breathable membrane. The Hoggs GT3000-WNSL has oiled brown leather uppers and an EVA midsole for excellent shock absorbancy. The Hoggs of Fife Shire-NSD is described as the “farmer’s favourite”. A sturdy non-safety dealer boot, it has pull-on tabs at both the front and back of the collar of the boot to allow easy putting on and taking off. With a dark brown full grain leather upper the Hoggs Shire NSD has been developed to withstand the rigours of professional country life. A Taibrelle® textile insulating lining allows the feet to breathe while wicking away the moisture and the hard-wearing oil resistant soles have excellent grip properties. Do please remember that leather is a natural and breathable material and should be kept soft and pliable. To prolong the life and comfort of your Hoggs Professional footwear we suggest that use regularly apply Hoggs Professional Dubbin to both the leather and stitching of your boots. This is particularly important if the boots have been worn in wet conditions. Hoggs of Fife Lomond Wellingtons are working wellingtons designed to handle the toughest conditions. They are a basic wellington made from 100% PVC with a synthetic lining and reinforced toe and heel areas. The Lomond wellingtons also feature a sturdy sole offering good grip and kick-off and pull-on ribs. These products are just a few of the many we stock from Hoggs of Fife. For the full range please click here.